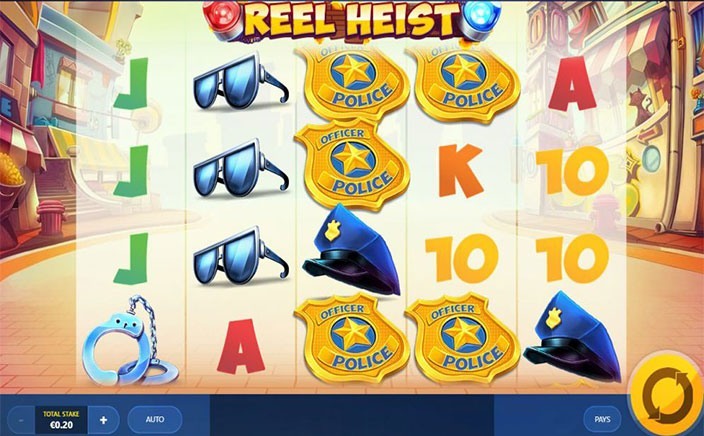 Reel Heist is an exciting slot game powered by the Red Tiger Gaming. The theme is inspired by the bank robbers and is full of action of police chases. The betting range is from £0.20 a spin to £500 a spin. 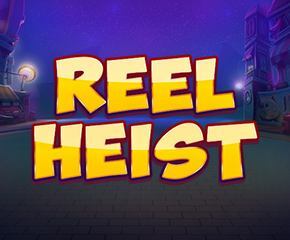 Reel Heist is really a fun game with the great animations and also with a very fast gameplay. The jackpot amount offered by this slot is 1000 times of your stake. Run and Run In Reel Heist! Reel Heist is designed with five reels, four rows and 40 paylines. The reels in the game are placed against the busy streets of the city. All the reels are white in colour and are also slightly transparent. The lower value gaming symbols here are the 5 playing cards while the higher value symbols are the sunglasses, the handcuffs, a policeman’s cap and the policeman’s badge. There also exists five different robber symbols and each one of them has a random prize attached to it. The Wild symbol in the slot is the cop here and it forms the winning combinations whenever it substitutes in the win. The wild symbol can also easily substitute for all the other symbols in game. The bonus symbol for the slot is the robbers. Winning combos on the reel are formed across the paylines but here the huge payouts come from the robber symbols itself. The 5 different robber symbols can make a landing on the different reels. Each robber symbol has a random prize attached to them that is ranging from the 10x to 2000x of the stake. Every time the robber makes a landing on the reels, then the cop will also be there in few short spins. This is exactly the moment when chase happens. The cop will initiate chasing the robbers across the different reels. There is a possibility of the several robbers on reels at once. Still, the cop will make a try to catch all of them. Moreover, if robbers prove to be very fast for the cop then he can also throw his own baton at them to get them stunned. By doing this, they will remain in the constant position until cop catches them. Once the robber is being caught, random stake prize is being awarded and this feature goes on until there exist no more robbers on the reels. Reel Heist is an interesting slot game. The game can be easily be played from any of the mobile devices that are powered by either Android or iOS. This is kind of slot where the player will never be tired of the action-packed thoroughly on the reels. The slot has an RTP of 95%.